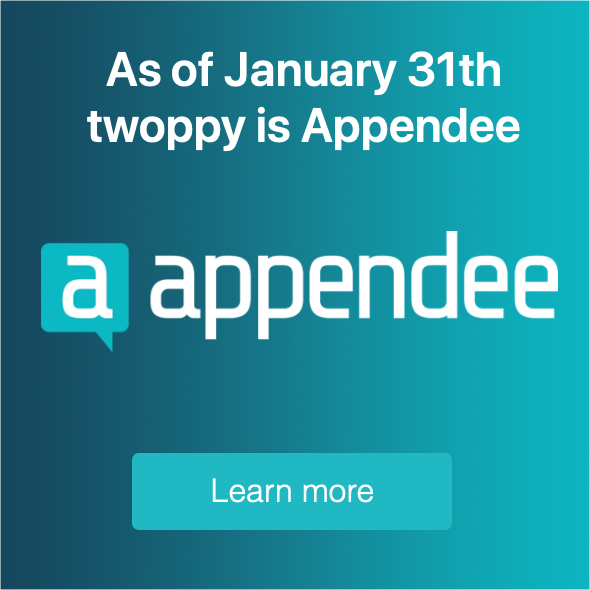 Please find below the Conditions of Use for Appendee, forming part of twoppy B.V., having its registered office in Leusden, 3833 LD, listed in the Trade Register of the Chamber of Commerce under file number 51437120. Appendee provides products and services in the area of information and (tele)communication technology for organisers and visitors to business and public events and/or social activities. Please read these Conditions of Use carefully and regularly as they describe your rights and obligations as a User of Appendee (a natural person or legal entity wishing to use and gain access to Appendee or wishing as a supplier to provide content for it). By using the Appendee website in any way whatsoever, for instance via appendee.com, appendee.com sub domains, Appendee domains with different extensions (for instance .nl, .net, .org, etc. ), via other (mobile) media or via the so-called Appendee API, you accept being bound by these Conditions of Use. Appendee reserves the right to amend these Conditions of Use at any required time without informing the User of this. You can read the most recent Conditions of Use by visiting appendee.com. If you use Appendee after the Conditions of Use have been amended you will irrevocably accept the amendments. 1.1. In order to gain access to Appendee the User can apply for an account with an access code in the manner as described on the website. Appendee reserves the right to refuse or block an account without stating the reasons. 1.2. If the access code does not work properly, the User should report this as soon as possible to Appendee and Appendee will then provide the User with a new access code. 1.3. The User must keep the access code strictly secret. Any use of the code will be attributed to the User. 1.4. If Appendee has established or reasonably suspects that unauthorised third parties are using or can use the access code or if the User informs Appendee of such a use, Appendee will immediately block access to the database. Appendee will inform the User as soon as possible of the unauthorised use and the blocking via a digital message. After the blocking Appendee will provide the User with a replacement access code as soon as possible. 1.5. Access must take place via a program installed by the User and a functioning internet connection. 2.1. Appendee hereby grants to the User the non-exclusive, non-transferable right and the User hereby accepts this right to use Appendee via a website, whether or not via a web interface, for an indefinite period of time and under conditions further detailed below. 2.2. During the term of this agreement the User is entitled to use the online content of events for which the User has registered, for the purpose it has been placed for. 2.3. The User can manage his own account. Depending on the user settings messages will be sent to the User. Appendee reserves the right to place content on Appendee which might be aimed at certain profiles. The User acknowledges and accepts this functionality of Appendee. 2.4. The User will fully comply with specific user instructions or restrictions announced or still to be announced by Appendee. 2.5. Appendee reserves the right to withdraw this right immediately in the event of abuse of the database and/or the search program or if there are strong indications of this abuse. 2.6. In some cases certain details with regard to for instance the user media, locations and histories used by the User will be recorded and retained by Appendee and used for user statistics rendered anonymous. 3.1. The User can supply content free of charge which content can be used by other users. The User is liable for the accuracy and completeness of the content supplied. h. any other act in contravention of the law, the codes of conduct as well as of what is considered appropriate in social and economic life. 3.3. Appendee reserves the right to refuse content, to filter it and/or to remove it at its own discretion. 3.4. Appendee enables a User to buy additional paid-for services. Appendee explicitly reserves the right to change the amounts referred to above. The User will be informed of this via a digital message. 3.5. The User will never be entitled to a refund of the amounts paid. Premature notice of termination or temporary inaccessibility of services or reduced services being available will never entitle the User to any refund of (a part of) amounts already paid. 4.1. The copyrights and any other intellectual property rights including the rights to databases and trademarks with regard to the content placed on Appendee are exclusively vested in Appendee and/or its suppliers or licensors. 4.2. A User who places content grants thereby to Appendee an unencumbered, global, non-exclusive license, free of charge, on the content to use, reproduce, distribute and disclose this information with regard to the services of Appendee as well as the marketing and/or promotion purposes of Appendee. This license is also understood to cover Appendee’s right to allow the use of the information by third parties and to allow third parties to reproduce these files. 4.3. Without the prior written consent of Appendee the User will not in any way wholly or partly disclose, reproduce or provide to third parties the content from (the database of) Appendee except in those cases where the consent is evident from the nature of the right of use. 5.1. In connection with its activities Appendee depends (partially) on the cooperation, services by and supplies from third parties over which Appendee has little or no influence. Appendee will never be liable for any loss arising from the agreement between the User and Appendee or its breach regardless of whether the damage is caused or becomes evident during or after the agreement with Appendee. 5.2. Any liability of Appendee for any other form of loss is excluded, including any form of indirect loss such as punitive damages, compensation of consequential loss, loss of or damage to data and loss due to lost sales or profits. 5.3. Neither will Appendee be liable for losses as a result of inaccessibility, incompleteness, inaccuracy or out-dated content on Appendee nor for the content supplied by third parties. 5.4. Any liability of Appendee will at any time be limited to a maximum of the invoice most recently paid. 5.5. Appendee will never be liable for the consequences of changes in or additions to Appendee made by or for the benefit of the User. 5.6. Appendee will never be liable for abuse by third parties by which the User suffers losses. 5.7. Claims for losses as a result of the foregoing must be submitted in writing to Appendee within 2 months after the loss arose on pain of any entitlement to compensation having expired. 6.1. In the event of any non-attributable failing in the performance the performance of the respective and associated obligation(s) will be fully or partially suspended for the duration of such a force majeure without the parties being obliged to pay any compensation to each other. The parties can only invoke force majeure against each other if the respective party informs the other party in writing as soon as possible of such an invocation of force majeure with submission of the necessary documentary evidence. 7.1. This agreement is effective for an indefinite period of time. The User is entitled at any time to terminate the agreement. Insofar as the User has bought a paid-for service from Appendee it is only possible to terminate the agreement after the term of this paid-for service has expired. – the control of or the decisive vote in the business operations of the other party transfers to a third party. 8.1. Appendee is entitled to change the software as well as the manner in which Appendee is organised and/or operates provided the changes are and remain in accordance with the applicable legal provisions. 9.1. Appendee is allowed without the prior explicit consent of the User to dispose of and/or encumber the rights and/or obligations under this agreement provided the rights and obligations under this agreement continue to remain effective. 10.1 Appendee is entitled to use the services and/or products of third parties in performing this agreement. 10.2. If or insofar as any provision of this agreement is declared invalid or is annulled, the remaining provisions of this agreement will remain in full force and effect. In that case the parties will consult each other with regard to any new provision to replace the invalid/annulled provision taking into account as much as possible the purport of the invalid/annulled provision. 10.3. Appendee states that the processing of personal details in (the database of) Appendee takes place completely in accordance with the Dutch Personal Data Protection Act (Wet Bescherming Persoonsgegevens) and that it meets all the conditions set out to this end. The User indemnifies Appendee against any claim by third parties. 11.1. This Agreement is governed by Dutch law. 11.2. All disputes arising from this agreement will be settled by the competent judiciary of the District Court of Utrecht.